Prior to the final game of the 14/15 season against West Ham, before we knew if the club would be relegated to the championship, Mike Ashley gave this interview to Sky Sports propagandist and fellow client of Keith Bishop PR, David Craig. It is Lee Charnley and the football board that make those decisions, as it was Derek Llambias who brought in Alan Pardew. I will not be picking the next manager – it is not what I do. My job is to make sure that they have the maximum financial resources and it is their job to get the best pound for pound value out of those resources. If I keep the club I will have the final say on players. I am the one who has to fund the club. My opinion is that he is lying now rather than back then. Ashley still has final say on every major change at the club, whether in the first team coaching staff, playing staff or around the boardroom. The very fact that Derek Lambias left the club after the appointment of Joe Kinnear shows the extent to which Ashley disregards the views of his employees to bring in the people he wants. Furthermore, even if Charnley had autonomy in the decisions, being hamstrung by a budget that compares poorly with any in the Premier league hardly leaves him much choice beyond promoting from within on the cheap does it? I will continue the policy of investing in the football club. 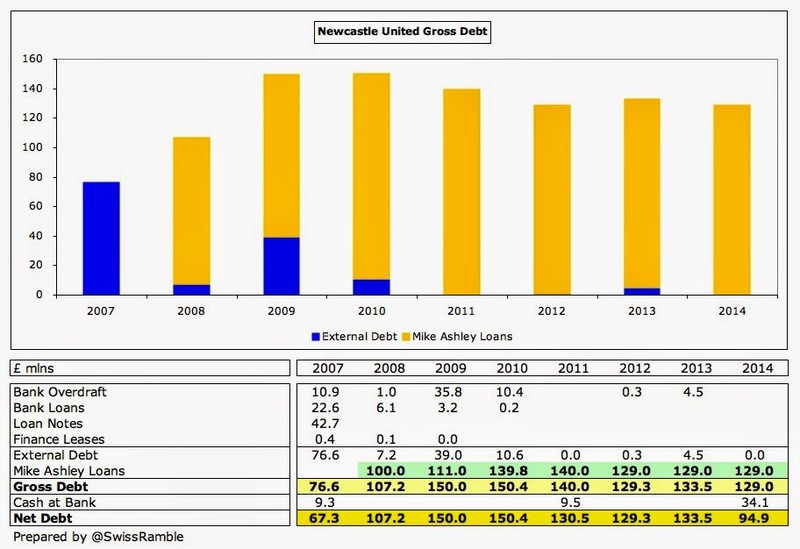 Ashley has not invested a penny in Newcastle United for 5 years, whether he starts to invest more money remains to be seen, but the use of the word "continue" is very misleading. In actual fact he has taken £11m out of the club over the past 5 years, as detailed in the 2012 accounts, which also state that £18m is repayable to Ashley within 12 months. Ashley has not been repaid that £18m as yet, but the note continues to appear in the accounts, suggesting he has every intention of taking it back at some point. Craig then lends a hand with the lies by asking Ashley where the club would be if Ashley hadn't cleared the debt. Ashley has done no such thing, as the accounts quoted above show and as the Swiss Ramble have detailed..
Mike Ashley doesn't correct this mistake. He takes credit for it and claims the position as a better one to build from than the one he inherited. Ashley then tells us that getting into the champions league is winning something. I can tell him that it most certainly isn't. As a Newcastle fan I am continuously reminded that it's now 46 years since the club won anything and we've been in the champions league a few times in the interim, no-one saw that as winning. These are the facts we can use to confirm Ashley's interview was not an honest and open acceptance of failings and a genuine pledge to push on, but another piece of PR designed to win over less informed fans ahead of the season ticket renewal deadline on the 29th. An interview designed to misdirect and give the appearance of a new direction while continuing the same policy of lying to fans and calling it PR.